If you’re currently using a non-Google Account to login to Google AdSense account, or has a separate AdSense logins with another Google Account which comes with some Google services such as Gmail, you will have to update the AdSense login to a Google Account. 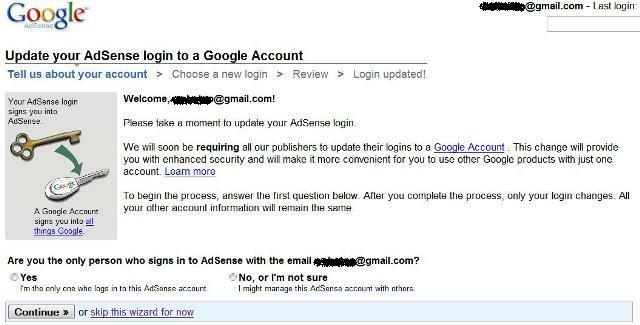 This will definitely solve the confusion for some Gmail users who reset Google Account password instead of AdSense password as currently, even if you use Gmail address to login to AdSense, it’s not necessary linked and associated with the Google Account. Please take a moment to update your AdSense login. To begin the process, answer the first question below. After you complete the process, only your login changes. All your other account information will remain the same. Then there will be plenty of questions to answer to determine what’s the best migration option available, either by using a master Google Account which used with an existing Google products, or create a new Google Account.